A happy marriage of flavours and textures: stifado with chilopites (small egg noodles). It’s been a while since we’ve given you a recipe. To make up for it, here’s a classic version of stifado, one of the most emblematic dishes in all of Greek cuisine – and one that is now rarely found well-made, although it is really not difficult. 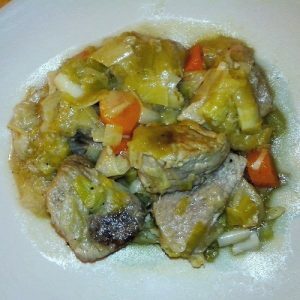 Stifado is a succulent slow-cooked stew of meat and whole onions (that’s important – onions are rarely a main ingredient in any European cuisine, whole ones even more rarely), strongly flavoured with various spices. A good stifado is a panorama of contrasting but well-matched flavours: sweet, spicy, meaty with a hint of sour, with a combination of melt-in-the-mouth textures, their balance chosen and developed by the cook. 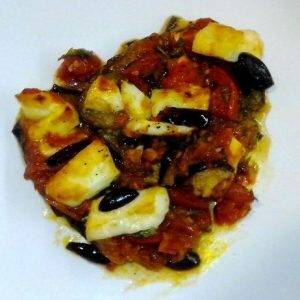 In many ways it is the most authentic of Greek dishes: it is a favourite Sunday meal in Greek homes and a highlight in really good traditional tavernas; it has no obvious parallel in the neighbouring Mediterranean cuisines, but it appears increasingly rarely on tourist menus. Why? Because it needs time and (a little) effort to make. More’s the pity: I remember stifado as a very common offering when I travelled in Greece as a child on family holidays, three decades ago. In the terminology of Greek cuisine, stifado belongs to the category of mayirefta (literally “cooked ones”), which describes dishes that are slow-cooked to allow the flavours of their ingredients and added spices to mingle thoroughly, so as to create a conjunction of textures, flavours and aromas that can only be achieved with that aforementioned extra ingredient: time. Like all mayirefta, stifado tends to be even better on reheating – so make enough of it! I’d love to give you a history of the dish (because sometimes we can, and it is interesting when we do so), but all we have in that regard is the name. Stifado is probably derived from the Italian word stufa, which means “oven”. 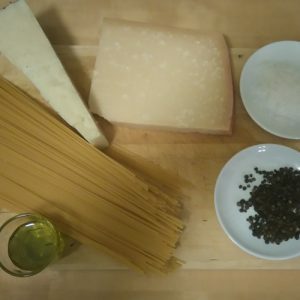 There are regional Italian dishes (in Sardinia and Sicily) called stufada, but they have no similarity to the Greek dish. The name probably just refers to oven-baking. These days, stifado is usually cooked in a saucepan, but before the arrival of modern cooking appliances in Greece, slow-cooked dishes were prepared at home and brought to the local bakery to be baked in its oven – that may just explain the name. Who knows when the first stifado was cooked? Onions have been cultivated in Greece since the Neolithic, and wild varieties are native to the country, such as this one on Santorini (image by Klearchos Kapoutsis). Stifado must have been around for quite some time, as there are regional versions of it across Greece, and while it is always made of meat and onions, the options are very diverse (the kind of meat, the kind of onion and the combination of spices are variable, as is the choice between marinating the meat or not). Like the best of Greek food, a good stifado combines great local and seasonal ingredients with a little or a lot of creativity and a personal touch – there are many variations of the basic dish, not just between regions but even between families. In all cases, it uses multiple and varied spices: their commingling with the main ingredient is what makes a stifado. The version of stifado I give below is not definitive. There can never be a definitive stifado, as there are so many subtle variations of it. Following the basic theme, you can take this dish in many different directions. The version given here is – quite simply – my favourite, based on my own experience: it is meant as a reliable and easy base recipe you can follow, but also as a starting point for your own ideas. Special stifado onions are on sale throughout Greece, especially in winter, such as these on a street market in Athens. The chalkboard label identifies this batch as originating from Viotia, the Central Greek region known to Classical scholars as Boeotia. It also contains a minor misspelling (styfado). – 1kg (2lb) beef (it doesn’t have to be pure steak), cut into large chunks or cubes, about 5cm (2″) across. There are alternatives to beef (see Variations below the recipe). – Just under 1kg (2lb) of baby onions. In Greek markets, special stifado onions are sold in winter, they are roughly the size of a walnut each and about 35 of them make a kilo. Apart from their small size, their main characteristic is sweetness. If no local sweet onions are available, you can use shallots. Peel the onions carefully, cutting off as little as possible: they are meant to retain their physical integrity. The onions are being sautéed. 1. If you have time, it is advisable to marinate the meat for at least 4 hours prior to cooking – ideally overnight. To do so, put the meat in a bowl, then add the herbs and spices, distributing them well between the chunks of meat. Finally, mix the wine and vinegar and slowly pour it in – the meat should be covered by liquid. Cover the bowl and place it in the refrigerator. If you forget to marinate, you can add all the marinade ingredients as part of step 4 below, but the flavours will be less intense. 2. In a large saucepan, bring the oil to a medium heat (it should be sizzling, not smoking). Reduce the temperature a little, place the onions in the oil and sauté them, moving and turning them carefully with a wooden spoon, to let them soften slightly and gain a yellowish tint. Don’t overdo it in terms of frying or stirring: the onions are meant to remain whole! This should take between 5 and 10 minutes. Remove the onions from the oil and set them aside. Chilopites are tiny traditional Greek noodles. They go well with stifado, as would orzo or similar small pasta. 3. Next, take the chunks of beef from the marinade, but keep the latter. Put the meat in the saucepan with the hot oil and let it brown on all sides at medium temperature – for a maximum of 10 minutes. 4. Add the onions to the meat, then the chopped tomatoes, the tomato paste and the marinade (complete with the various herbs and spices). Add salt and pepper to taste (it can do with a fair amount), then mix everything – carefully – with your trusty wooden spoon. If there is not enough liquid to cover all of the meat, add a little water. 5. Raise the temperature. As soon as the mixture starts boiling, reduce it again to low or medium low at most. Let the mixture simmer slowly – and without stirring – for up to 2 hours. Should the sauce remain very liquid throughout, add a heaped teaspoon of cornflour 5 minutes before the end of cooking time. Stir it in extremely carefully. 6. Take the stifado from the heat and let it cool down for a few minutes before serving. 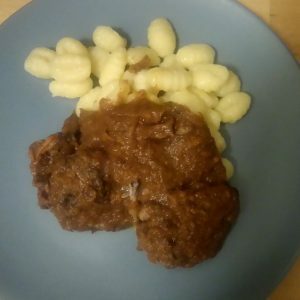 Stifado can be eaten by itself with some fresh white bread, but it benefits from being served together with an accompaniment that can soak up some of the sauce. In Greece, it is often served with chilopites (traditional small flat egg-noodles) or with soft oven-baked potatoes, more rarely with rice. Fava would also work. Enjoy (with a glass of that red wine you used)! Beef is one of two classic meats used for stifado. The other is rabbit, which also leads to delicious results, prepared in the same way as above. I have even come across lamb stifado now and then. A really interesting and highly recommended variation is octopus stifado: to prepare it, you should dry-fry the (chopped) octopus for 10 minutes or so before marinating, otherwise the recipe is the same. I am aware of vegetarian versions replacing the meat with mushrooms, but I have never tried that. It should be possible to achieve the same texture of the whole onions following the version given here, with the mushrooms briefly fried and added to the onion-tomato-spice stew an hour or so before completion. Dried “special” mushrooms (no, not that special: porcini, chanterelles or something of that sort), soaked in advance – of course – would certainly improve the interest. White beans, also soaked in advance, could also work. The marinade might work on beans, it won’t on mushrooms. The finished dish, ready to be enjoyed. Regarding the onions used, most Greeks certainly associate stifado with the small stifado onion, but it is not entirely without alternatives. In the Peloponnese, I’ve been served stifado made with full-sized white onions, so that option exists, too (in that case, go for the same weight of onion as meat and follow the recipe as given, adding a few minutes to stage 2). The combination of herbs and spices used in stifado varies greatly, according to personal tastes. For example, many versions omit the cumin, the nutmeg, the cloves and/or the cinnamon. Some even add a little sugar. In my version, the balanced combination of allspice, cinnamon and cumin is central to the resulting flavour and aroma, with the tomato doing its bit in the background, but there is room for experimentation. Stifado is just one of the typically Greek slow-cooked dishes. If you are curious to try them in their natural environment, you should consider joining us on one of our cultural and archaeological tours or cruises in Greece!